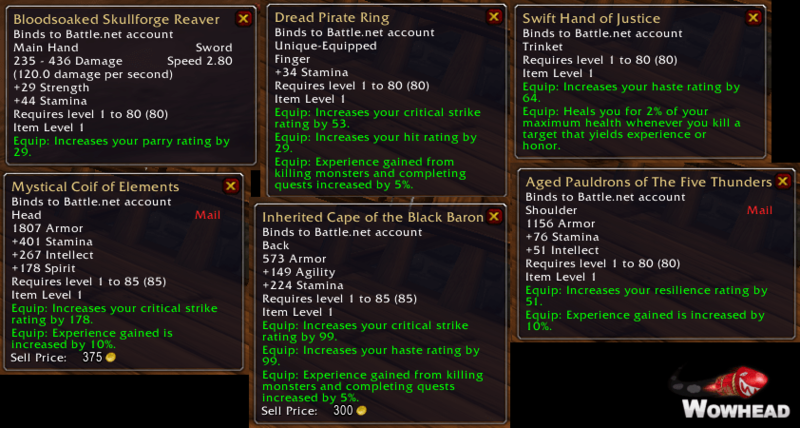 BoA Heirlooms…are they just hand me downs? Bind on Account heirloom gear is the focus for the latest audio segment. If you are an alt-oholic like me, heirlooms have been a god-send. They can stack to a maximum of a 40% boost to your leveling speed. Most max out at 35% due to the difficulty in getting the fishing derby ring (+5%). Some heirlooms don’t provide a leveling boost, but they are blue-equivalent gear, level up along with you, and don’t require repairing. Plus, you can sell even more questing/dungeon gear that you acquire, saving you significant gold along your journey. First, you pretty much need a max-level character (although you can earn heirlooms through the argent tournament, starting at level 77). The most common way to purchase them now is with Justice Points. There is a specific heirloom vendor in each main capital city. If you have multiple alts, try and consolidate your gear across multiple alts. For example, you can use agility leather for your hunter, enhancement shaman, and feral druid. The armor bonuses aren’t crucial, especially considering the grinding time you’ll save. You can also spend your time pulling your fingernails out by grinding seals through the argent tournament, but personally, that’s not my recommended method. Helms and cloaks are available through your guild vendor, and require reputation and quite a bit of gold. However these pieces work from 1-85, and all other heirlooms lose their benefits at 80. You can follow me @epicdiapers and follow my blog and hear all of my segments at epicdiapers.com.